This is NOT a shoop. The Church of Scientology’s in-house magazine Source has promoted the program as being aimed “to shift the creation of a new civilization into overdrive”. Apparently the one thing this building has guaranteed is substantial profits. Not sure how this guy (in that outfit) represents a “new civilization” today, perhaps it will offer a temporary defusing of tensions in the middle East by reason of wide spread befuddlement about the program in itself. RING RING! The 90’s is calling and want’s its velour jogging suit back. 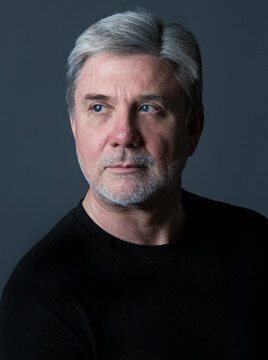 Michael Todd is a hairdresser with his eponymous salon in either London or the East Grinstead area. A very serious koolaid drinker. Anyway, a couple seconds later I did get it and I gasped. He is definitely showing off the clothes rather than something else. He’s in some kind of modeling pose. The importance is on the clothes/uniform. Don’t know why I should be so surprised…it’s just another angle of the “must look and act a certain way at all times.” I remember when Mi$c was expected back at the base and we all got reminded to “walk with purpose,” don’t chit-chat outdoors, don’t walk past the windows of the offices he frequents, don’t be seen smoking outside your office door. (There were never any breaks allowed per any time clock or contract.) There was a time when people were video’d walking around and then shown their video and told to shape up their demeanor and posture. There were times at briefings where we had to react to certain statements in certain ways or find ourselves in trouble. Very regimented control on how one acted and what one said. Yet it’s not a branch of the military. I remember a comment from yesterday’s photo of the line-up of young ones in black uniforms (or very dark blue?) which was about how this didn’t look like a church. Definitely! 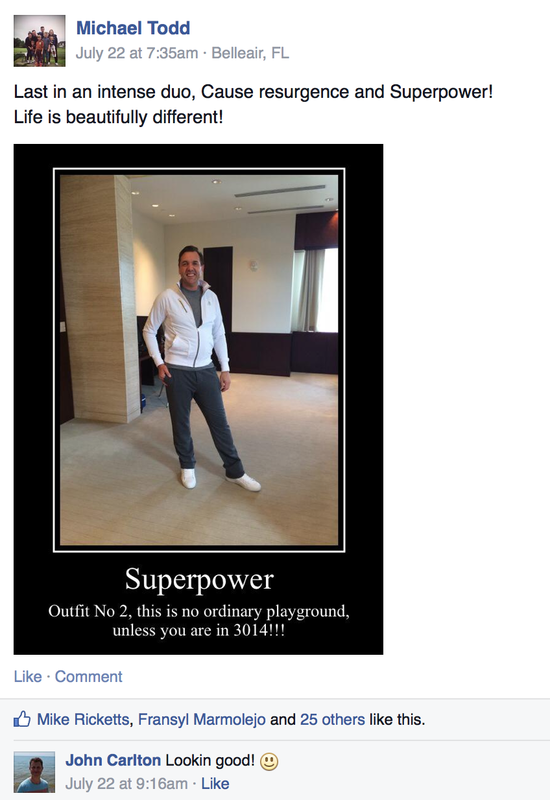 This fellow is in nice looking exercise clothes which is a uniform needed to do Super Power? Also not very church-like! Oh! I get it now – silly me! I think or read somewhere Mike Ricketts is one of the IAS Regges 10% commission dudes that will be waiting in the Reg Office. Ah! Now all is revealed! How stupid of me eh? What I find truly pathetic in all this are the Kool Aid drinkers that feel compelled to show their support for this nonsense by “Liking” on Facebook. What exactly needs “liking” here? It is a no-story, a nothing, a damp squib, a non-entity. Sooner or later they will start posting pictures of “people outside the Org” – whooaah!!! but of course not daring to go in as there is a team of IAS Regges waiting in the Reg Office to “greet” them. This whole thing is so lame. Mike, I know that now they have certain uniforms for certain SP RDs. Is there a different uniform for each RD? And if so, are they included in the price or does the public have to purchase them? And, finally, why uniforms at all? Is this just another way of fleecing their members? Sorry OSD. Don’t have a clue. This is a new level of crazy I am not familiar with. Though I would bet everything I own that they make you pay for these special outfits. Well how ‘special’ is that! And…I’ll bet you that they are expensive too! Those poor Int Base staff having to run around in 117 degree heat. DM needs to be put down like an old dog. It’s breaking my heart to think of what they are going through. Marc, I truly have to admire your getting through what you did. I keep my copy of your BFG right next to my High School and Office Dictionary, two of my most useful items. It doesn’t look like 3018. More like a late 90s hotel lobby. But maybe he means the rundown itself? Of course it’s the best thing to hit this universe evaarr, this side of the big bang. What does it do? Will it make us all wake up one day and see the error of ways, recant and return to the loving arms of DM? I think the reference to 3014 is the projected date for getting the 12,000 scientologists in the Tampa Bay area through the Running Pgm. Hey, at least there is some accuracy in that statement. The only problem is the location. There are 12,000 Scientologists on planet Earth, not Tampa. When I did the running program at the Int Base in the early 1990’s, it was summer and easily triple digit temps around then. I did it midday for a minimum of 5 hours each day. I went through several pairs of shoes and could have been mistaken for a Soboba indian I was so tan. My outfit was some beat up old shorts and a ratty T-Shirt. No where in any of the Advices or write-ups (it was a pilot) were there any mentions of swanky outfits. Also, with very little money, the last thing i wanted was to burn my cash on some stupid clothes that would just be ruined within a week or so anyway. When I see this, I really think that the public that they are catering to are the Kanye types. How lame does one have to be to care what outfit they wear while running in the dark? Outfits are the least of there problems. It is so super dark inside the running program (CRRD) at the Super Power Building, the biggest issue they have is public running into the pillars! Yep, Dave has it so dark that you can barely see in there. At least when I did the program at the Int Base, we were running around a giant palm tree in the hot sunny desert. Oddly enough, I was at the Int Base last week. It was 117 and after one trip around the car, I was ready to call it a day! Mark, this so-called Cause Resurgence RD, aka, the “Running Program,” was basically what you were doing in the triple digit heat at Int, correct? This was used as punishment. So now, because his dwarfness has nothing new to sell, it’s taking a something used as punishment and re-branding it as a Super Power RD. Would that be about right? And if I am correct, that’s a pretty scary thing! BTW, bought and read your book. Outstanding! Glad you’re a thorn in their side. Yeah, been there, done that! I did it in full SO uniform…. sometimes we got to put on sneakers. It was random. Was it in the summer, Mike? And, if you didn’t have sneakers on, what kind of shoe were you running in? Yep, summer. I think Marc was out there concurrently. SO uniform shoes. Black leather lace-ups. I wore out several sneakers. You can forget about the ‘Nike’ brand, they didn’t have the stamina it takes to make it through the CRRD. The idea of running in SO uniform and SO shoes is REALLY insane but that is for the out-tech and punishment trip. This Michael Todd guy didn’t drop his weight or this photo was taken quite later on after he put the weight back on…..Weird. I got that he was about to start…. He just got decked out with his new togs and is heading for the dark circle of cause to launch himself into outer space…. This makes me think of something: What’s with the super dark room for the CRRD, which would be nice to do with windows all around, so you could have a nice view outward (since Clearwater does) as you run? It seems to me that this might be helpful to distract your attention from any discomfort and help you keep going by putting your anchor points out into the horizon. Even auditing rooms that have a shaded window are nice because you perceive the sunlight and the outdoors behind you as a preclear. I always liked that but then again, I just like the outdoors period. Is the darkened room to emulate Space? I noticed a similar pattern with the Int Base, that has windowless offices on floors where people work all day, with extreme florescent lighting. Why is this? What’s wrong with having a view or a connection to the outside and natural light? I’ve also noticed it with a lot of the new Ideal Org course rooms. In many renditions I’ve seen, there again, windowless rooms. This strikes me as odd, there’s just something off about it to me. A “running in space mockup”. I see. But you wouldn’t run in space with a body now would you? Bodies are earthly material. This is supposed to be an OT process, for the thetan, so what does it matter what the physical mock up is? Except that you have to drag your body through it, so a little lookie-see to the outside might be nice. It’s a little convoluted. Whatever. If anyone likes it and it makes them happy and fulfilled is well enough. To each his own. I still don’t get the windowless room trend though. I am going to call this “RPF chic.” It’s soooo 1997. The sweatshirt is too tight. Pocket is bulging. 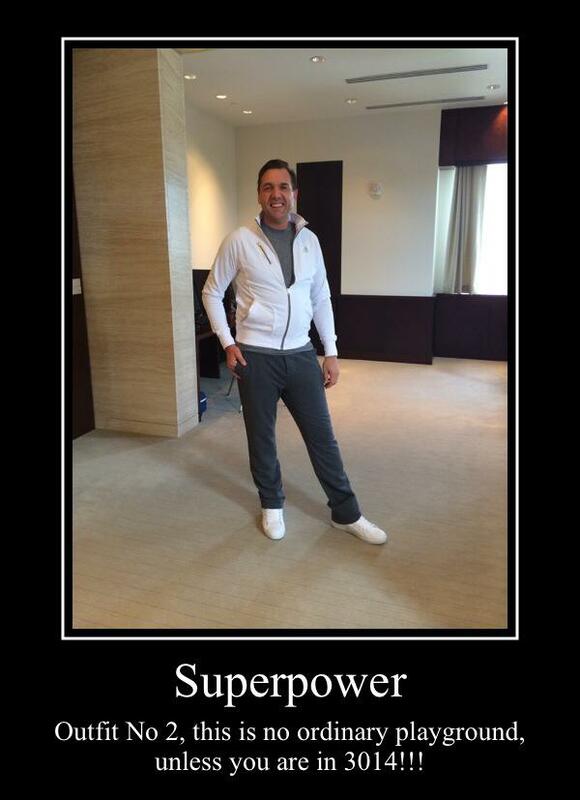 Pity, since he’s got super power over everything now … except, of course, the sweatshirt. Dressed like a Jersey gangster or bookie. So ecclesiastical. Hey Michael, can you put $100 on the New Orleans Saints in the Sept 7. Falcons/Saints game for me. Thanks!! Is the idea to have folks doing the Cause Resurgence and Super Power rundowns wear outfits that are so embarrassingly ridiculous that they will be ashamed to mingle with any of the non-Scientology locals in Clearwater? I mean really. That track suit (I guess that’s what it is) looks like something Gomer Pyle would have worn in 1974 while out for a jog. Come on FLAG…please stop the stupid! I showed this picture to my hairdresser who just adopted a baby with HIS husband. His response was fabulously flamingly gay, they guy is so closeted – a 15 on a scale of 1-10. Other than that, I’m not sure why that outfit is so fabulous? I certainly wouldn’t get caught dead in sweats and a too-tight warm up jacket with glow in the dark white shoes that looked like they had never been used. PS what does an outfit have to do with religion – unless it’s Papal Vestments or something, I guess. That was my first impression, a tad on the gay side. Hi Valerie – years ago, my husband told me that I should not patronize my gay hairdresser because he was well, gay and therefore 1.1. He might mess up my hair on purpose or something like that and couldn’t be trusted. I told him kindly that a smart man never interferes with the relationship between his wife and her hairdresser. It’s “women’s business”, plain and simple. He never brought it up again. Regarding the outfit, it has nothing to do with religion. It’s part of the gimmick, along with emulating Space with a blackened out room on the CRRD. It’s not really necessary. But he is out of PT, contrary to all Super Power purposes; unless you have that outfit you are not in PT, it only applies to 3014…sort of. Maybe he needs to re do his objectives. I think you need to be a comp to fully get it! Glad we are on the outside looking in. Yes, that does make sense, Coop. And I’m glad you, myself and all the other posters ARE on the outside looking in. Scientology has become a Freak Show in my humble opinion. I know that look. It’s the look of delusion. I thought they had to wear black boiler suits when running around a pole. Cause regurgitation, RPF style. That reminds me, where can I get one of those cool two-tone clip on polyester ties that the oh-so-handsome Seaorgers wear? I can’t help but feel sorry for these people. They are so brainwashed. Running around a pole is supposed to help you spiritually? Well, in any case they’ll spend thousands and drop some weight in the process. It will be interesting to see how many just drop dead. They aren’t getting any younger. Rob Roy (Arrrrg, but tis a good Celtic name! ), you do know that what they call Cause Resurgence, aka the running program, was actually used as punishment at Int Base? They would make people who ran afoul of his dwarfness run around a pole in the heat of summer for hours on end. I don’t recall seeing any “Success Stories” about how COB changed their lives by trying to give them heat exhaustion. I did eat the Brown Acid and it kept me out of the Sea Org!!!!!!!!!!!!!!!! Exclamation point tech rules!!!!!!!!!!!!!!!!!! It’s all about the MEST, pathetic really. If you don’t have stats to show, just look handsome instead. I don’t get it. What’s with outfit #2? What’s with the picture of this guy? What’s with 3014? A little help here. He’s over 18 years of age. He’s got new clothes, not too much, not too little, clean look. They are avoiding the points we criticize. Thanks, Ken! But, why do they need 2 outfits to do Sooper Dooper Power? And did they just put the date of 3014 out of their collective butts? The older I get the less scientology makes sense to me. Now,Ken, I do understand owning them! That gives me 3 swings every time. Ken this Old Surfer Dude will probably need more explaining in the future. . I think what he means is that he had a different uniform for the “perceptic drills” rundown. I think you’re right Ken. We own them…….BUWAAAAHHHHHH!!!!!! He’s modeling outfit number 2 for us. Very elegant. I have no idea about 3014, it’s just glib stuff. 3014: He’s trying to make the point that Super Power and CRRD are very advanced, like way into the future; 3014. The glee of standing in an empty hallway. Work it Michael ! You look fabulous. I don’t get it. He looks healthy and happy. So he thinks a place Miscavige spent a hundred million or two to build looks nice and futuristic? Not a surprise, not controversial, and not a reason for any sort of ridicule, that I can see. “not a reason for any sort of ridicule”? In case you aren’t joking, here’s what I find ridiculous. 1. He’s communicating that he has completed “Cause Resurgence”, which means he has finished running in a circle in a big, round room, a privilege he paid $2500 for. 2. Apparently, he needed a special outfit for that, because this is outfit number two. Maybe he thought outfit number one was worth $2500? 3. He’s standing like a model (sort of), a foot pointed to the side and his right hand gently held against his leg (as if he’s actually using the pocket, but placing no weight on the pocket as it would wrinkle the pants), which is a silly thing to do; however, his facial expression shows he isn’t trying to be silly – he’s damn proud of outfit two and how he looks in it. 4. He’s placed the photo into an “inspirational themes” template and written something not-so-inspirational (or even a little bit clever) at the bottom. He looks super fabulous! I wonder if they make that outfit in kids sizes so David Miscavige can partake in all the fabulosity! Nice outfit Mike Todd! You definitely look beautifully different. What’s your next bridge step? The cult of MEST worshippers. I am beginning to understand the Jewish and Christian value against worshipping idols.